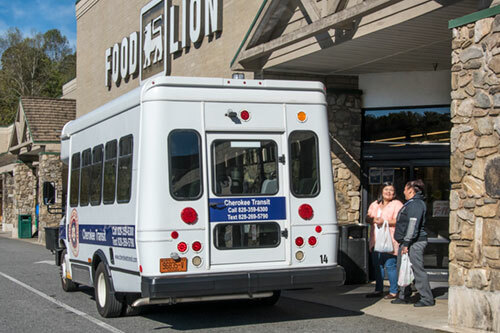 Cherokee Transit runs every half hour from 7:00 am until 11:30 pm when the last shuttle leaves the Casino going to the hotels. Monday through Friday, weather permitting. Closed on Thanksgiving Day, Christmas Eve and Christmas Day, New Years Day. The Mountain Trail route follows US 19, US 441 and the connecting Business 441 (Casino Trail). See map. The River Trail route follows US 441 North (Tsali Blvd), Acquoni Road and a portion of US 19 to the Casino. See map. Riders can transfer routes at or near the US Highway 19 Welcome Center. The adult fare for River and Mountain Trails is $1.00. Cherokee Transit tokens are accepted for fares. Each token equals $1.00 in fare. Shuttle busses operate year around. The fare is $1.00 for adults (each time you board). Transferring to Community Trails routes involves the applicable charges for your route. Rates are based on zones, with a charge of $1.00 per zone entered. Upon boarding, please tell the driver your final destination and pay the entire fare for your journey. Exact change please. Driver cannot make change. Senior Citizens and Youth Discounts - Children 0-5 years of age ride free. Senior citizens (age 59 ½ and over) and children ages 6 to 12 pay half the regular fare. Map Too Small? On smaller devices, double-click (or double-tap) the map to zoom in. Then keep pressing to hold the zoom and move around the map.